With hundreds of different religions and schools of thought regarding spirituality, it is easy to point out how these numerous denominations greatly differ rather than focusing on the similarities that these spiritual teachings have. Since our culture tends to get caught up in pointing fingers and judging others especially when it comes to matters of politics, culture and religion, often times we forget that everyone is ultimately striving for the same goal; to find inner peace and happiness. Browsing through Live Well’s Pinterest board titled Spirituality I came across a “pin” that really stuck out to me which may be seen in the upper left hand corner of the collage. The word Namaste is a Hindu word used for greetings and salutations, and as the image indicates, it is a profound gesture that honors the “divine” within a person. 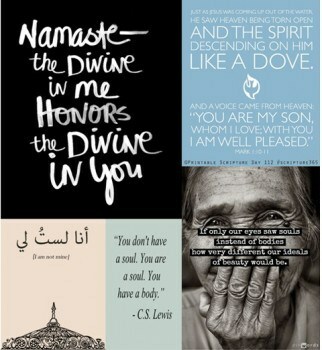 So what is this divinity, and what does it mean to honor the divine in someone else? This image sparked the idea that most religions have this idea in common which honors an unearthly presence that each being holds within themselves. As a cradle Catholic, I grew up learning that as Christians during the sacrament of baptism we are adopted as children of God and given the gift of the Holy Spirit. For Christians, this sacrament allows our souls to be reunited with God despite the disconnect that occurred during the fall in the garden with Adam and Eve. Though I am not an expert in other world religions, I have picked up this recurring theme of differentiating ones physical being from one’s soul. For example the lower left hand image which reads, “I am not mine” and is translated in Arabic also ties into this idea. Similar to Christian views this simple image points to the fact that our souls or the divine being in each of us belongs to something greater than our worldly being. In addition to two of the largest world religions, famous authors and philosophers have observed this notion as well. C.S Lewis, the famous British writer and scholar known for his series The Chronicles of Narnia also toys with the idea. As he once said. “You don’t have a soul. You are a soul. You have a body.” No matter what your beliefs are, there is something so beautiful about being able to recognize another person’s inner dwelling and worth on such a deep level.